SPECIAL BUNDLE OFFER - Buy now and get a free bottle of nitro fuel and a starter set! This is a great package if you are looking to get into nitro RC cars. You will have everything you need apart from normal AA batteries. If you want to race off road and on road then the Condor is the model for you. Beginners soon become novices so the Condor has still been designed with performance in mind. The PRO version features a 2 speed gearbox, alloy shocks and is fully ball raced. The SE version has a lot of the upgrades pre-installed. Unstoppable power allows this off road truck to go where others don't dare. For the serious off roader the Conquistador nitro radio controlled monster truck makes short work of the toughest terrains. The Monster SE version has a lot of upgrades pre installed.The shaft driven 4WD system ensures that you wont be getting this truck stuck in the mud. The Yama Buggy is built with many aluminium parts and looks great with oil filled, colour coordinated shocks. The suspension provides a superb feel on uneven surfaces and its high power 26cc engine gives impressive acceleration. The petrol rc buggy is equipped with a responsive and reliable brake system, you won't need to worry about stopping when hitting high speeds. By popular demand we are now stocking a range of unbuilt nitro radio controlled car kits for those who enjoy building models as much as using them! Forget lego etc, these self build kits provide hours of fun and when they are finished they are actually fun to use! There is no other product on the market that gives such a complete all in the box kit like this. Once you have built your model you can go and race it with the 2.4GHz radio equipment. 2.4GHz gives you longer range, better reliability and also allows you to race your car without any interference from fellow racers! ORDER NOW AND GET A FREE BOTTLE OF FUEL WORTH £9.99!! The all new Acme 1/16th nitro cars - Half the size but twice the fun! All the features of a full sized model packed into a super mini, super cute little monster! These nitro cars are so much fun whizzing round your garden or take them down to your local club to wow the crowd with something they have never seen before. This is the brand new upgraded pro version of the Yama petrol radio controlled buggy. This popular model has been upgraded to make it more powerful, perform better and finished off with a striking new body shell and colour scheme. We have two versions of the Yama Pro. This version has special tyres that perform particularly well on loose surfaces. If you are looking to drive on loose surfaces such as sand then this is the best choice. If you want to race off road and on road then the Condor Pro nitro RC buggy is the model for you. With high speed performance and off road capabilities you get the best of both worlds. This model features a 2 speed gearbox, alloy shocks and is fully ball raced. The SE version has a lot of the upgrades pre-installed. Introducing the special edition R-SPEC version of the legendary XSTR radio controlled car from HSP. This is the PRO top of the range upgraded version of the XSTR electric buggy. As well as the features found on the standard XSTR this PRO version has been upgraded with FSD 3300KV brushless motor, Hobbywing 50A brushless ESC and Fullymax 7.4V 3500mAh Lipo battery with Lipo charger. This special edition comes complete with a range of red colour-coded parts and shell exclusive to the R-SPEC. This monster is FS Racing's newest 1:5 scale gas powered model. It's powered by a big 30cc engine that runs on normal unleaded 93# or 97# petrol mixed with 2 stroke oil. No more having to buy nitro fuel from model shops, the RC car will run on normal petrol and 2 stroke available from any petrol station! It features big chunky parts, working LED lights on the front and roof, and a real spare tire mounted to the back. It comes fully built with everything you need including 2.4GHz radio set. This is our highest spec electric radio control car. Designed with pro racing in mind you can race and win at a National level. It's feature packed with many new exclusive innovations found only on this model puts it ahead of the competition. The Werewolf will go well over 50mph, an upgradeable setup means this buggies potential is endless. PRO Version. If you are looking for an entry level low cost RC car that is simple to use but still very fast then the brand new range of 1:12 scale electric models from HSP are a great choice. The buggy is a great all-rounder that performs great either on or off road. The model comes fully assembled and ready to roll straight from the box. It has enough advanced features including a powerful Li-Po battery and waterproof receiver / speed controlled to make it fast and fun but at a super low price and without the complexity of an advanced model. It comes complete with 2.4Ghz transmitter that allows multiple models to be used in the same area without interference. These RC cars can be raced almost anywhere with the buggy suspension and power needed for off-road and the speed and handling for on road. The light weight and powerful motor matched with a Lipo battery makes them very fast so they are great fun for bashing around a back garden or racing against a friend. The Trojan has all the characteristics of professional remote control cars - adjustable suspension, oil shocks, aluminium suspension towers, waterproof speed controller and high precision waterproof receiver and servo. It is powered by powerful brushed RC380 engine that comes complete with aluminium heat sink to keep it operating at its peak. All you need to do is charge the 7.2v battery and away you go! The Raptor truggy is a high performance, high speed speed machine. With its unique truggy tyres and low centre of gravity design the models performs both on and off the tarmac. The 4WD system with front and rear differentials evenly distributes the massive power to the wheels making the Raptor a race winner. Once you have built your model you can go and race it with the 2.4GHz radio equipment. 2.4GHz gives you longer range, better reliability and also allows you to race your RC car without any interference from fellow racers! The 1:5 Scale FS Racing radio controlled off road buggy is powered by a massive 30cc 2 stroke petrol engine, delivering hard acceleration, fast top speeds and amazing cornering. The new racing buggy features a metal roll cage, all metal diff gears, an extra large fuel tank and a carbon fibre look body shell. The new bigger 30cc 2 stroke engine can deliver speeds of 50mph+ providing you with an exhilarating driving experience! The engine runs on normal unleaded 93# or 97# petrol mixed with 2 stroke oil. No more having to buy nitro fuel from model shops, the model will run on normal petrol and 2 stroke available from any petrol station! To handle the extra power the steering servo has been upgraded to a higher torque 30kg/cm model and the gears are made from strong metal and sealed for extra protection. This is a precision manufactured high quality model with a massive feature list. This is the pro brushless version of the FS electric Marauder. The 3265KV brushless motor is paired with a 45Amp brushless ESC and pushing the RC car to faster speeds. As standard the model comes with a 7.4v 2700mAh Li-Po battery. The brushless motor and ESC can handle more power so you could upgrade your battery to an 11.1v Li-Po battery and you will see even further speed increases. The Marauder is the latest 1/10th electric radio controlled car from FS Racing. This fantastic looking model features a modern hatch frame shell finished with rear mounted real spare tire, working LED lights and cool little replica driver and co-pilot! It does not just look great though, it also performs great. With aluminium chassis, four wheel drive, slipper clutch and waterproof electronics, the Marauder is a proper hobby grade racing beast. This is a high spec, pro built radio controlled buggy that is also highly upgradeable. This is a proper RC hobby racing machine! Aluminium centre drive shaft, high spec waterproof speed controller, powerful 540 motor, aluminium capped oil filled shocks, performance diffs, aluminium radio tray and much more! The XSTR buggy is in a league of its own. The model comes complete with a cool replica driver and being a buggy is an excellent "all-rounder" model that performs well on or off road. For all the speed junkies! The Cyclone is our quickest RC car for on road racers. Perfect for the beginner it features a simple gearbox which will allow you to be racing in no time. Although more simple than the PRO version the Cyclone is still a seriously fast racing car. Available in two versions, Mazda Style or Subaru Style. Introducing the special edition R-SPEC version of the legendary XSTR RC buggy from HSP. This is the PRO top of the range upgraded version of the XSTR electric buggy. As well as the features found on the standard XSTR this PRO version has been upgraded with FSD 3300KV brushless motor, Hobbywing 50A brushless ESC and Fullymax 7.4V 3500mAh Lipo battery with Lipo charger. This special edition comes complete with a range of colour-coded parts and shell exclusive to the R-SPEC. ORDER NOW AND GET A FREE SPARE 7.2V BATTERY PACK WORTH£14.99!! This is the PRO top of the range upgraded version of the HSP RC car. As well as the features found on the standard car, this PRO version has been upgraded with FSD 3300KV brushless motor, Hobbywing 50A brushless ESC and Fullymax 7.4V 3500mAh Lipo battery with Lipo charger making it extremely fast. The Bullet buggy is a high performance, high speed machine. With its unique design the Bullet RC buggy performs both on and off the tarmac. The 4WD system with front and rear differentials evenly distributes the massive power to the wheels making the Bullet a race winner. The special motor in this model is much quicker than the motors found in other models. This fab model comes equipped with 2.4GHz radio equipment which means longer range and also no interference from fellow modelers! 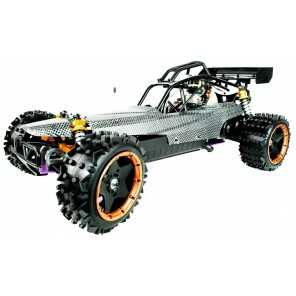 The FS 1:5th gas RC monster truck is an extreme model with a lot of upgrades pre-installed. The first thing you will notice compared to other models is the bigger powerful 30cc engine instead of the standard 23cc that pushes it to impressive speeds of up to 50mph+! The engine runs on normal unleaded 93# or 97# petrol mixed with 2 stroke oil. No more having to buy nitro fuel from model shops, the model will run on normal petrol and 2 stroke available from any petrol station! This Hummer truck is a beast with a massive feature list including aluminum roll cage, 700cc fuel tank, aluminum air filter, sealed metal gears and adjustable carb. If you are looking for an entry level low cost RC car that is simple to use but still very fast then the brand new range of 1:12 scale electric models from HSP are a great choice. 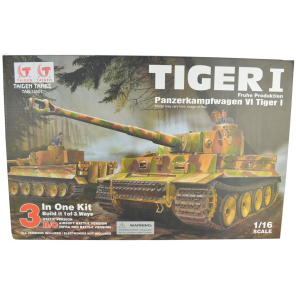 Sitting half way between a hobby grade model and a toy model, it has enough advanced features including a powerful Li-Po battery and waterproof receiver / speed controlled to make it fast and fun but at a super low price and without the complexity of an advanced model. As a monster truck, it has extra ground clearance and massive wheels compared to cars and buggies, making it ideal for off road driving. It comes complete with 2.4Ghz transmitter that allows multiple models to be used in the same area without interference. Our new full 1:10 scale Raptor brushless rc truggy self build kit. With a big brushless motor and 11.1V Li-Polymer battery these models are ridiculously quick and at an amazing price! Everything you need to completely build is in one box. This is the faster brother of our brushed Raptor kit - build it, then race it, and win with it! The Marauder is the latest 1/10th electric radio controlled car from FS Racing. This fantastic looking model features a modern buggy frame shell finished with real display mounted spare tire, working LED lights and cool little replica driver and co-pilot! It does not just look great though, it also performs great. With aluminium chassis, four wheel drive, slipper clutch and waterproof electronics, the Marauder is a proper hobby grade racing beast. This is the PRO top of the range upgraded version of the Bug Crusher electric radio controlled monster truck. As well as the features found on the standard truck, this PRO version has been upgraded with FSD 3300KV brushless motor, Hobbywing 60A brushless ESC and Fullymax 7.4V 3500mAh Lipo battery with Lipo charger.